8.30, driver picks you up at hotel. 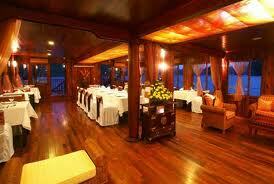 11.30, Welcome on board of Halong Ginger and set sail through bay while lunch is served. Passage into the magical bay, where thousands of sculpted limestone islands rise from the waves like dragons’ teeth. After lunch, take a short trek to a nearby summit for a panoramic view of the bay dotted with Halong Ginger golden sails, go swimming on a quite beach or sunbathing on the sundeck. Later afternoon, visit an interesting fishing village with opportunity to interact with fish men who have been living in the bay for almost three generations. At sunset time, kayak or simply take a bamboo row boat to discover a water tunnel with many coral reefs in a scenic lagoon. Back on board Halong Ginger , enjoy cocktails while watching sunset and later unwind at Ginger restaurant.